Great solutions for shell scheme graphics. Transform plain exhibition booth backgrounds into vivid promotional enhancements with our solutions. Choose from inexpensive roll-up pvc posters, glorious fabrics or easily removable wallpaper. All our solutions can be re-used over and over again, saving you fortunes in the long run. 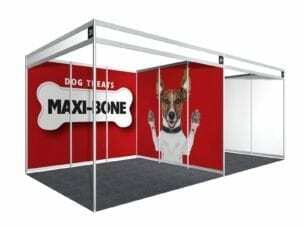 Plain shell scheme walling at exhibitions can be easily and cheaply transformed with our professional shell scheme graphics. Our solutions are all re-usable and can be removed and re-fitted time and time again for different exhibitions and events. We manufacture these to your exact specifications and provide printed panels which you can attach using double-sided tape or hook and loop velcro. Our self-adhesive panels use a special re-usable and removable adhesive. Our printed shell scheme panels are far less costly than expensive freestanding displays. Plus, they can be used for other marketing opportunities once the exhibition is over. Panel sizes vary between exhibitions, but as a rule of thumb they are 950mm wide by 2340mm high. When you book your space, you will be provided with exact specifications. Use these to design up your graphic panels. Design them either to fit individual panels, or to stretch across an entire wall. Our PVC and Blackback shell scheme graphics can be easily fitted using either double-sided tape or velcro – without damaging the shell scheme itself. Easy to fit and easy to remove. Our self-adhesive shell scheme panels are also easy to fit and reposition, as well as remove and re-use. Which type of panels should I choose?